I must admit, just watching Vince Carter play last night, can not only change the outcome of a game, but it has to change the way the team leadership is shown inside of the locker room too. This translates to winning games even with a poor record. As Carter walked off the court in D.C for the last time tonight, he headed to the same locker room he has for years now, only with different teams and he did so with his team taking a 137-129 victory with him. Bradley Beal may have had one of his slowest starts to the season, but when the fourth quarter rolled around he was able to shake off, a foul-ridden performance with 18 points to get Washington back to within 4 points with a minute to go. They had a chance to really put the pressure on the Hawks, but Taurean Prince banked in a dagger three at the end of the shot clock to seal the win. “There are games like this one where we had a chance to come back and capitalize in the final minutes. 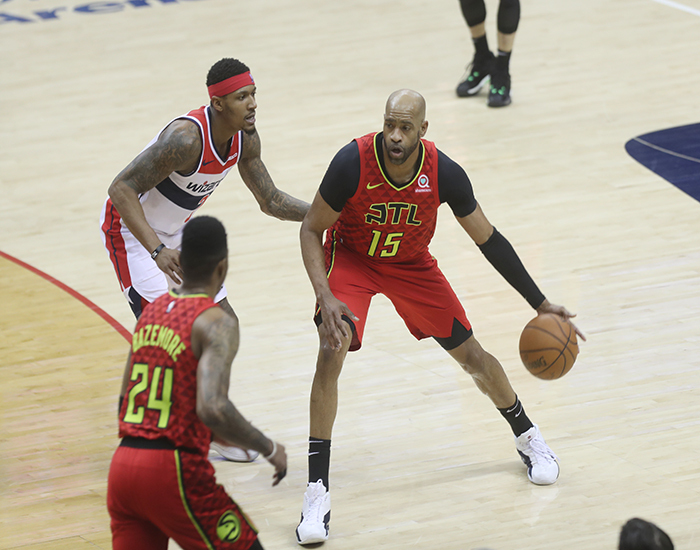 With Lin and Carter on the court, their veteran leadership forced us into some mistakes that hurt in the final two minutes,” said Wizards Head Coach Scott Brooks. Several Wizards stepped up in Beal’s extended absence due to foul trouble, as Tomas Satoransky picked 11 first half points to go along with five rebounds and five assists. Jordan McRae added 13 second quarter points, while Ariza and Jeff Green each had 9 for the half.